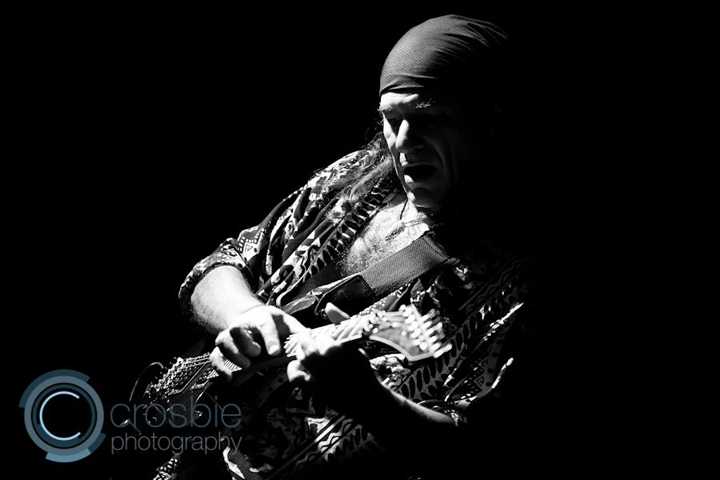 Graham Greene, AKA the guitar shaman from Oz, is one of my favourite musicians. 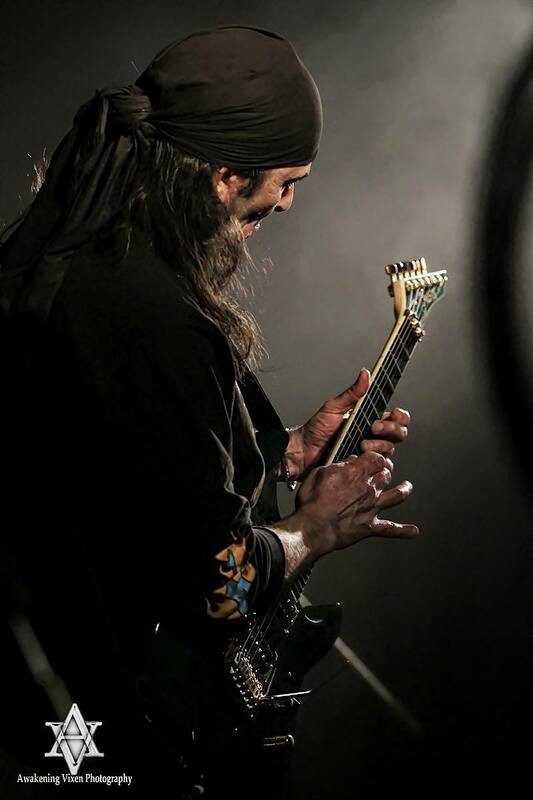 His guitar playing has been compared to Steve Vai and Joe Satriani, and I first got into his music because of his instrumental rock releases – an underrated and underused genre in my opinion. Albums like Leap Of Face, Blue Feather, and Gaia Rising were my first taste of his work and I’ve been wanting more ever since. 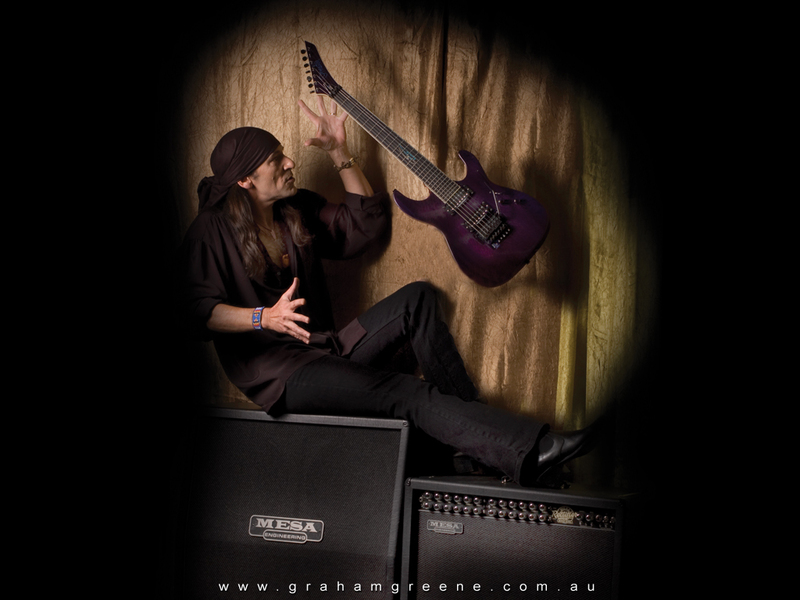 Greene has extensive experience in the music world: he played in Australian rock-band Ice Tiger in the 1980s, he’s worked as a music producer, he’s endorsed by Ormsby Guitars and Mesa/Boogie amplification, has released several solo albums, and has played with various bands over the years, including Jac Dalton and Resonance Project (with his wife and vocalist Donna Greene), and recently he did a stint as guitarist for Australian band Hells Bells. Last year he released a great solo EP titled Lord of Misrule, and he has just released a brand new album called Down Devils Road. I’m so grateful to Graham for answering some of my questions! Graham Greene. Photo by Crosbie Photography. Q. First of all: congratulations on the new album: I’ve listened to it and it is fantastic. Lord of Misrule was released last year, and Resonance Project released Tale Goes On not too long ago as well, and this year you’re back with Down Devils Road – are you feeling unusually creative and inspired right now, or are you always working this hard? Graham: Thanks very much, Maria. Earlier last year we released the two new EPs, and also remastered my first EP, Blue Feathers for digital release, so we put a decent amount of music out there. We had been writing and recording things at home while we were also writing and recording with Jac Dalton, so by the time we had finished working with Jac, I had most of the music written and recorded for our EPs. We went to a studio to record Donna’s vocals for Tale Goes On, then did the mixing and mastering at home and put all three things out at once. I do go through periods of quiet, productivity-wise, but when I get into a project, I find it hard to leave it alone until it’s done. I felt that we had picked things up a notch with our writing and recorded performances as well, so that added some impetus to my efforts in getting the stuff finished and released. It was also good to get the tunes out of the way to make room for the next phase of development which, as it turned out, was a little while coming. Q. You’re flexing your musical muscles on these latest releases: the track ‘Chicken Soup for the Soul’ has a real taste of the blues, there’s more of that on your latest album, and you even venture into some jazz sounds! What is the inspiration for this musical stretching? Graham: Whenever I pick up a guitar and just noodle around, I always wind up playing blues licks and little things that I’ve never recorded. I decided with Chicken Soup to just get it out of my system and do a Blues tune. I avoided getting too fancy, opting instead to go for melody and feel. Rather than stretch myself technically, I stepped out of my modal comfort zone and found things that were a little ‘outside’ melodically. I was really pleased with the result, and the piano solo was something that just seemed perfect for that part in the song – it was cool to have the guitar take a back seat while another instrument stepped out front. This album has a different feel to me, and I think it is in part due to the fact that for a while I was really just writing and recording pieces of music without a clear goal in mind. I was experimenting with different things such as horn sections and orchestrations, and even when it was decided to do a full album I kept my mind free of any self-imposed restrictions and went with whatever felt right for the last four tracks that I wrote to complete the album. There were also a few places where I let my guard down – and not necessarily by design. Graham Greene & Donna G on stage. Photo: Awakening Vixen Photography. Q. I feel like there are several tracks on Down Devils Road that go pretty deep, emotionally as well as musically. One of them is the hard rocking tune ‘Hand on the Handle’ with Donna on vocals, and another is ‘Through The Dark’, which almost brought me to tears when I listened to it: it’s a beautiful tune, but also full of deep sadness or sorrow. Can you talk a bit about the inspiration behind those tracks? Graham: To say that the last twenty one months have been intense would be an understatement, and some of that has found its way on to the album. The period following Donna’s diagnosis was surreal, and I found myself to be both totally immersed and strangely disconnected. At times the music truly was a refuge, and it was those moments when it was just me, the guitar and the song alone in the studio that things got personal. When you look into a piece of music and see yourself looking back, you know it’s getting real. ‘Hand On The Handle’ was a vocal that Donna and I put down in a day, after I had done the music tracks as a fun diversion, experimenting with stuff I’d picked up from playing with Hells Bells. Donna’s part was her fighting back from both her MS and the doubts that had surrounded us as we moved forward. She nailed it in a couple of takes, and a day’s fun turned into a great song. ‘Through The Dark’ is a kind of chronicle of a particular period in my journey but it is not chronological, as in starting at the beginning of the piece and following through to the end. It is in layers – the backing tracks were done when I was at a desperately low point, and the long, drawn-out intro section paints a particular picture of loss of direction, of searching for something to cling to. The melody and harmony guitars and the acoustic guitar parts came later, when I was in a different place, and in a mindset to take the song home. Listening back to that tune now, I can still feel where I was mentally and emotionally during each part of the recording process. So, in many regards, it has real depth, and was truly cathartic at a time when I was needing to close some doors in order to open others. I have put sadness into notes before, but I think this is the first time I allowed some pain to come through. The results were ultimately satisfying, but it was not always comfortable in the making. Q. You’ve been involved in bands like Ice Tiger in the past, more recently with Resonance Project and Jac Dalton, bands that feature a vocalist, lyrics, and all that… However, a lot of your solo work is instrumental rock. What made you get into instrumental rock in the first place, and what keeps you coming back to that genre? Graham: I really enjoy playing in a band setting where there is a lead singer taking the spotlight and running the show, because there is much less pressure on me and I can relax and have fun. That being said, the Jac Dalton Band was no easy ride, as I was singing a lot of harmonies and switching lots of harmonizer and effects patches in my rig during the songs. Bands like Lady Zeppelin and Hells Bells were much easier workload-wise. I had always listened to instrumental music, right from when I was a kid in The Bush listening to classical music on ABC radio, and when I got the chance to record a solo EP in 1998, it was an opportunity to put some of that inspiration to work. As I got more into writing and recording my own stuff, I really felt that I was finding my voice, which is what I think developing as a player is all about. Playing the instrumentals allows great freedoms and also imposes some responsibilities. I have the space to go where I please musically, but the music and the shows shouldn’t just be vulgar displays of technique – it must speak to people who may not necessarily play an instrument, and I want to be able to touch a common nerve through that universal language. As I learn more, I find I have more to say, so there is always a new tune or song to write. Each piece, while being part of the journey, is a journey unto itself, an adventure waiting to be had. That keeps me coming back. Graham: The 80s was a great time for rock music and the guitar, although there was a downside. Any fashion or trend will begin, catch on, become huge, become a parody of itself and then be replaced by the next fashion or trend. It has happened with clothes fashion, music fashion, food fashion… the list goes on, and I guess in some way may reflect the human condition – I’m not sure. The 80s were a great time to be a rock guitarist, as so many new players came out who raised the bar as far as what could be done on the instrument. 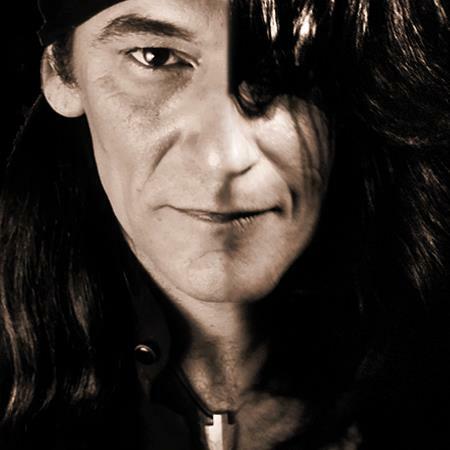 Eddie Van Halen, Steve Vai, Joe Satriani and Yngwie Malmsteen all set the standard pretty high, and there were thousands of guitarists who drew from them and emulated them to one degree or another. An unfortunate side effect of all these guitar gymnastics was that in a lot of cases the music suffered. Those vulgar displays of technique I mentioned before? This is exactly what I was talking about. The 80s was a decade-long guitar Olympics, full of shredders, guitar gods and… well, a whole heap of players that were talking a lot and saying nothing. To be a big band in LA in 1984, you had to have a guitarist who could play fast and a singer who could sing high. A lot of bands had that, but not all of them had good songs. A big number of those bands who did have good songs – Bon Jovi, Whitesnake, for example – are still travelling today. I look back at the rockstar days in Ice Tiger with fondness, because I had a fantastic time playing that music to those crowds. If I was asked to do it all again today in the same getup, I think I’d pass. Spandex can tend to ride up, anyway. Every decade is somebody’s “good old days”, and the 80s were mine, for better or worse. Graham Greene on stage. Photo: Awakening Vixen Photography. Q. When did you first start playing music, and playing guitar? And what or who inspired you to want to become a musician? Were there any bands or players back then that “lit your fire”? Graham: My first instrument was my mother’s Ukulele, which had been in her family since before the Second World War. In fact it went with an Uncle when he was shipped overseas to fight. Mum also had the family piano – a big, iron framed upright built in 1913. These were the first instruments I learned to play from around age 10 or 11. I would memorise melodies from movies or the radio and pick them out on the piano, a skill that would come in handy years later. Playing the Uke gave me the basic mechanics of guitar playing, so when I got my first guitar I already had an idea. At this stage, I had no interest in the guitar or in playing music as anything more than a distraction – that obsession came later. As a kid, I was into Beethoven and Scott Joplin. The first songs I learned were ones I sang with Mum and her friends when they were having a beer around the piano. I had no clue who the Beatles or Stones were, but I knew ‘Roll Out The Barrel’, ‘She’ll Be Coming Round The Mountain’ and ‘There’s A Tavern In The Town’. I guess my musical beginnings were a little different to some rock musicians. Living in a remote area in the far north of Western Australia will do that. I was nearly fifteen when rock and roll arrived in my life, and I remember the moment clearly. I had done my time in boarding school and was living with my mother who had moved down to Perth while I completed my high schooling. We had a pool table and record player in the garage, and I was out there one evening, just knocking a few pool balls around. I saw three albums on the bench next to the record player, and decided to put one on for some background noise while I played. The albums were Slade Alive, Master Of Reality by Sabbath and Deep Purple In Rock. I recognised the Mount Rushmore reference on the cover of ‘In Rock’, so put it on and turned back to the pool table, not knowing what was about to come out of the speakers. ‘Flight Of The Rat’ started playing and something happened, right at that moment. I don’t know if the hormone fairy chose that second to arrive, or some synapse clicked into place, but I felt something I’d never felt before, and I had no idea what it was. The pool cue became a six-string, and I’ve been a guitar nerd ever since. I’d always been a bit of a show pony if we were messing around at home, but this was the beginning of Graham the performer. I lost interest in most other things, and formed a band at school with some mates. As soon as I left school I joined a band, started doing gigs and worked at my playing until I was good enough to turn pro, which I did in 1982. The first band that I really got into was Status Quo, and my first hero was Ritchie Blackmore, who combined some classical influences in his music that appealed to me. I soaked up anything that I thought was good, and that included just about any style. If it was good, it was worth learning from. Q. Tying in with the previous question: Who are some of your favourite guitar players now, or other musicians that you find inspirational? Graham: There are some amazing players out there today, and they are easier to find thanks to the mixed blessing that is the internet. The fact is that while I am aware of what’s going on in music today and keep up with familiar artists and friends, I don’t do a whole lot of recreational listening. When I was younger, I was inspired by other guitar players. These days I find inspiration in less obvious places, but an eventful life will always lead to eventful music if you are tuned in and stay open to it. That all being said, I still like to listen to my old favourites when the mood takes me. Larry Carlton, Steve Lukather, Eric Johnson, Steve Morse, Jeff Beck, Rush… all those guys have been influential in my development at some stage. Some of the newer players that have caught my ear are Guthrie Govan, who is a flashy yet mature player, and a brilliant acoustic player named Andy McKee. And, of course, all those five year old Korean kids on YouTube who make us all look sick. Graham Greene on stage with Hells Bells, at The Prince of Wales Hotel. Q. I loved reading your recent blog post about playing with Hells Bells, the band that tours rather relentlessly, performing the music of AC/DC live on stage for audiences all over Australia. It seems you had a lot of fun doing those gigs! And do you feel like you learned or rediscovered something, musically, by getting into the AC/DC repertoire so deeply? Graham: Hells Bells are such a great bunch of guys, I had fun from the word go and it was a year well spent. I hadn’t played many AC/DC songs up to that point, so it was all very new and fresh from a playing perspective. I think there’s some Acca Dacca in every Australian’s DNA, because it all felt familiar to me, even the songs I knew I’d never heard before. It was mostly pretty easy, but definitely not boring. Back In Black is one of the greatest rock and roll albums of all time, and I picked up some nifty tricks from both Angus and Malcolm Young while I was getting inside how they did things. Restraint is the first thing you learn when playing AC/DC songs. They have a stripped back approach to writing that has served them well for many years, and nailing that groove they have is the thing to master in order to do the songs justice. 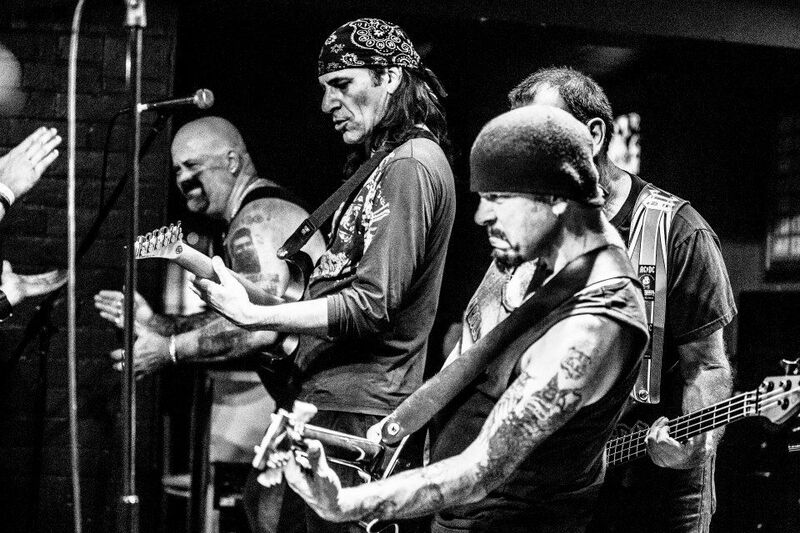 Playing some good songs with a good bunch of guys – sometimes that’s all it needs to be. Graham: Ah, yes. The groper in the front row. One of the hazards of letting the audience too close to a low stage. First gig with the ‘Bells, first unaccompanied guitar hero moment, and this rather drunk lady was doing the dirty dancing thing right in front of me. Being the seasoned rock’n’roller that I am, I played up to it, even when she started hanging off my leg. However, when I sensed some sudden and firm pressure in a place not accustomed to sudden and firm pressure, I apparently levitated backwards three feet without using my legs. That’s the way Mal (Osbourne, rhythm guitarist) saw it anyway, and he’s sticking to his story. By the time we got to the next gig the following night, all the fans had heard a version of it and there was a shrubbery of waving hands in front of my mic stand when we went onstage. Quite an introduction to Hells Bells, but at least I felt accepted. There have been so many memorable moments – Playing gigs with Bon Jovi and Meat Loaf was a hoot, and getting Gregg Bisonnette (David Lee Roth, et al) up to play drums with Ice Tiger was definitely a moment. Headlining the overseas contingent with Resonance Project at My Dinh National Stadium in Hanoi was a real highlight, both from an audience standpoint – the concert was televised to six million people – and the fact that it was something Donna and I did together that was a first for an Aussie band. One not-so-glamorous moment was being rushed from a concert to hospital in an ambulance with a suspected sub arachnoid (brain) haemorrhage after hitting my head on a low-slung steel beam just before the end of the set. At the next gig, the crew had ransacked a construction site and plastered the stage with signs reading “Caution – Hard Hat Area”. Bastards. Q. One part of your musical career that jumps out at me, is that your rock’n’roll version of ‘Waltzing Matilda’ was included in “Jay and Silent Bob Go Down Under” – how did that come about? Graham: That was just one of those out-of-the-blue things that you never see coming. I had arranged and recorded the track in an afternoon, purely on a whim. It was like a dad joke – people would hear it, smile and groan. Exactly the response I was after. I had put it up on YouTube as a gag, and received a few hits when I got an email through my website from someone wanting to know how to license a piece of music. The email was from Jordan Monsanto, the wife of Jason Mewes (Jay), and the project was a TV special and DVD that had been recorded in Australia. I imagine that they had been scouring the web looking for music that sounded intrinsically Australian and happened across my video. The offbeat rendering of a classic Australian folk song was perfect for what they wanted, so a contract was signed and I wound up in the credits of an international DVD release from the creators of Clerks and Mallrats. 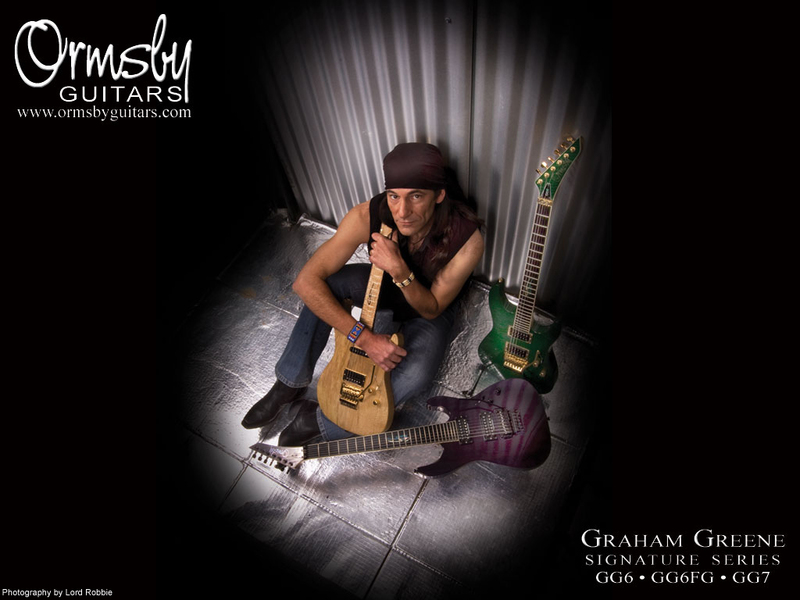 Graham Greene for Ormsby Guitars. Q. What kind of gear do you use in the studio and on stage? I know you’re very much an Ormsby man when it comes to guitars, what is it about those guitars that appeals to you? 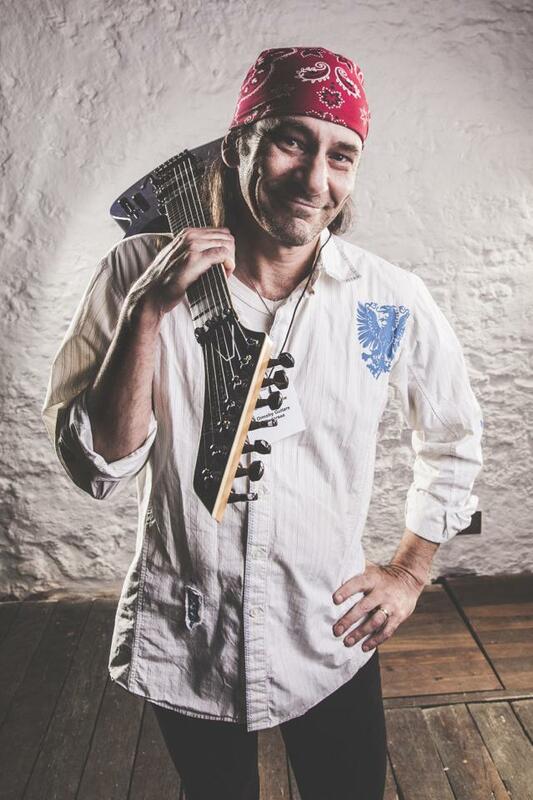 Graham: Perry Ormsby introduced himself to me in late 2004, when he offered his services as guitar tech for a couple of Ice Tiger reunion concerts. As payment, I recorded some audio sample tracks using his guitars, and the association grew from there. I now play my own signature series guitars, of which there are three models, and often borrow additional guitars to inspire me when I’m writing or recording. My album, Leap Of Face featured eight different Ormsby guitars, and I used six Ormsbys on this latest release. Perry’s instruments are exceptional, and the guitars he made for me are perfectly suited to my hands, style and sound. Having a collection of bespoke guitars with my name on them is something I never considered a possibility, but it is certainly something I appreciate and enjoy. In the studio I also use my Taylor acoustic and Bass Collection bass, borrowing extra instruments as needed. My main amps since 2006 have been Mesa/Boogie, with whom I also have an endorsement deal. Having a Boogie rig is another dream-come-true type experience, and the tones generated by the Ormsby/Mesa combination are just sensational. My main stage amp is the Mesa/Boogie Road King, but in the studio I tend to mix things up a bit and borrow other Boogies to add to the fun. Q. You received an award for Best Instrumental Rock Artist in 2008 for your song ‘Impressive Hair’, and your guitar playing has received high praise from many in the music industry… Do you feel like there is an appreciation in the music industry for your talents, and for instrumental rock? And do you even care about what “the business” thinks of the work you do? Graham: The 2008 Star Music Awards was billed as ‘The Independent Grammys’, and held at the Henry Fonda Theater in LA. Winning the award raised awareness of me a bit, but didn’t exactly make me a household name. The main thing I took away from that experience was the satisfaction that someone outside my home country had noticed. Craig Goldy (guitarist, Rough Cutt, Guiffria, Dio, Budgie) rang from the US to congratulate me and say that he and the other industry people associated with the awards held my music in high regard. Again, it didn’t fill my bank account, but it felt good. Instrumental music is a small niche in today’s market, and guitar music more so. In Australia, it is a numbers game – big country, relatively small population. This means that there aren’t enough people to form a sustainable market for a solo guitar instrumentalist in this country unless his name is Tommy Emmanuel, and even Tommy spends most of his time in the US these days. Q. You have an active presence online with a website, blog, Twitter, Facebook, all that. What are your thoughts on this brave new world online with streaming music, fans downloading albums (whether paid or not…), and how all this has influenced the musicians and the music business. I’m fairly certain I wouldn’t have found your music if not for the internet, and the ability to buy it online (thank you, CD Baby! ), so obviously this new-fangled stuff has some advantages. Graham: The rapid rise of the internet caught the worldwide music industry (and many others) with its pants down in a big way, and things are still settling down. I’m in two minds about it all, but one thing is certain – it’s here to stay. It is much easier to get material in to the marketplace, but the same old problems of standing out from the crowd still apply. You can build a website and put your music on iTunes, but the internet is a big place and getting noticed is harder than ever, because everyone has access to the same space. Without a plan in place and a lot of hard work, an artist is simply sitting in a tiny boat in the middle of a huge ocean with no bait on their hook, hoping for the big fish to happen by. Possible, but not probable. Q. To go with that previous question: What are your thoughts on the state of rock’n’roll in the world right now? Many people seem to think it’s almost spent as a force, especially compared to (once again) that golden age of the 1980s, or even the 1990s when grunge rock was a force to be reckoned with. I hear a lot of great new rock from new bands, but fame and fortune seems to be far off. But maybe fame and fortune were always rather far off for bands and musicians even in the “old days”? Graham: Another thing that the internet has done is make everything more visible. We see more success, and we see more struggle. We see more of everything, so it’s difficult to compare. The mainstream market has changed, but that just means that the media is looking at something else right now. MTV stopped playing music videos, but those artists were still writing, recording and touring, and a lot of them still are. The nature of current media trends favours the instant and the disposable, so we don’t see bands or artists developing in the public eye – we have this season’s ‘Idol’ winner, then we have next season’s winner. There is no depth of talent in the pop charts, simply fads and just-add-water personalities who strive to shock and disturb in order to gain that fleeting moment in the public eye. You are right – there’s still a lot of good rock music being produced, it just takes a little more effort to find it, because mainstream media is too busy fearfully scrabbling for ratings to find it for us. Success and fame are two separate things to me. Ninety nine percent of the musicians on the planet who are making comfortable livings from their craft are people you’ve never heard of, because they don’t work for famous people and aren’t in the public eye. The day of the big, long-standing rock star may be over for now as far as mainstream media is concerned, but folks still be rockin’. It’s just different. Graham Greene and Donna G for Resonance Project. Q. I know you’ve dealt with some serious things in your life recently. One of those things was that you suffered an ear injury and were unable to play or listen to music the way you usually do. That sounds like something that would be pretty traumatizing for a musician. Also, and more seriously, your wife Donna was diagnosed with MS a while back. I’ve had some things happen in my life that flipped my world upside down, and I know it can shake up your priorities, your world-view and your everyday life. How would you say these things have influenced you and your outlook on life and music? Graham: Donna’s diagnosis of MS was like a death in the family at first – we were blindsided, and it took us a while to fully grasp the changes that had been forced upon us. Once we adjusted to our new ‘normal’, we could take stock and focus on what was still possible, and things didn’t look so bleak. I joined a carer’s support organisation and made use of their counselling services, which was a big help in getting my head around things and finding some balance. Music became a place of solace, and it was therapeutic to be able to put the feelings somewhere – for both of us. 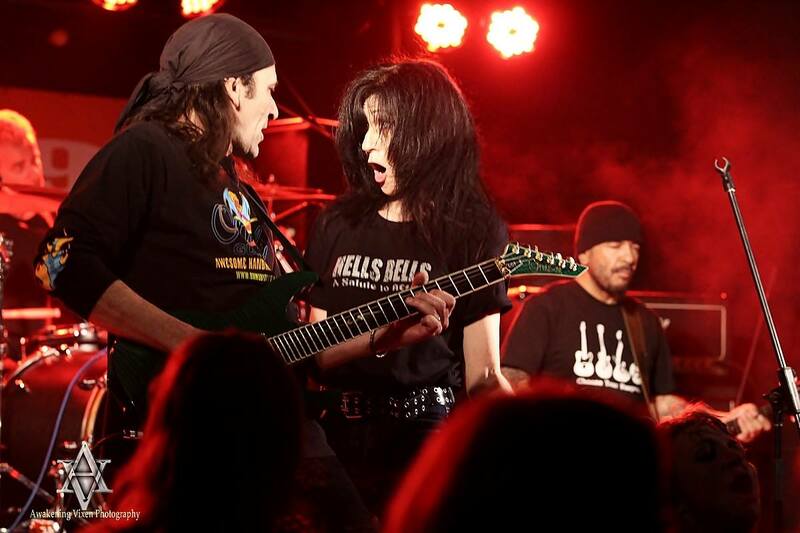 Donna is a woman of great strength as well as great talent, and the way she has clawed her way back to a place of being able to function and even perform again is an inspiration – inspiration that came in handy for me when I damaged my ears last New Year’s Eve at a gig. The ear injuries couldn’t have come at a worse time, as I was finishing off the tracking for the album and then had a whole heap of mixing and mastering to do. After taking the time to make sure I would do no further damage, I carefully finished what I had to do, monitoring at low levels, before having another break and then turning up the volume a bit to add the finishing touches. ‘Steady, steady’ was the only way it could be done, so I relaxed and went with it. Removing any source of stress is very important to dealing with long term illness, and that is reflected in the way we approach music and life now – if it does not serve us in a positive way, we don’t bother with it. Life is too short. Q. You’re based in Perth, which as I understand is one of the most remote cities on Earth. What is the city like for musicians? Do you feel there’s an appetite for local music? Graham: Perth has the dubious distinction of being the most isolated city on the planet, but has a comparatively healthy music scene. It was absolutely booming in the 70s and 80s, with dozens of big venues and lots of bands playing in them – between 1982 and 1992, I was averaging 300 shows a year, and I was not alone. Things are different now, but there are still some great acts coming out of WA, and some of them have developed strong followings. Q. What music, bands or artists, do you listen to these days, whether old or new? Graham: When I’m working on music, I very rarely listen to anything outside of what I’m working on. There is always some melody or arrangement floating around in my head, so that’s kind of the musak of my life. The last CD I bought was by an Australian classical guitarist called Karin Schaupp and a recorder virtuoso called Genevieve Lacey. Not very metal of me, but it’s a great album. I will still drag out some Rush, Dream Theater or Larry Carlton from time to time, and I have followed the latest exploits of Whitesnake with interest – their new Purple album sounds wicked. I have also gotten right into Nightwish over the last year or so. Locally, I’m really digging Ragdoll and Chaos Divine. Graham Greene. Photo by Matsu Photography. Q. If you could go back in time to when you were first starting out as a guitarist, what wise and sage advice would you give yourself? Graham: Set a goal, and don’t get distracted from your path. Learn to say no. Be prepared to step out of your comfort zone, take a chance and – above all – work hard and have faith in yourself. Q. And my final, dreaded question: you’re stuck on a deserted island, you only get to bring three albums with you… which ones do you bring? Graham Greene’s new album Down Devil’s Road is out now. It’s available as a CD via the Graham Greene Shop or as a download via iTunes, CD Baby, Amazon MP3 and Google Music. Read my review of the album here!